Located in Tucson, we are locally owned and pride ourselves on building relationships with the artistic community. From professionals to school projects to creative hobbies our expertise will get you on the right track. We have been providing artists with the finest materials throughout the world for the past fifteen years.With more than forty (40) years of combined experience in this industry, selling and using the various mediums and products. We are continually striving to bring you the finest in service and materials. Sarnoff Artist Materials was nominated for a Lumies Business Award. 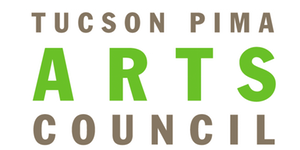 This award is presented by the Tucson Pima Arts Council to a business that has made Southern Arizona a wellspring of creative vitality and one that promotes the value of arts and culture in Southern Arizona. It is with great pleasure we announce Sarnoff Artist Materials acquisition of Paloma Art & Framing Gallery. Paloma Art & Framing Gallery has had an exceptional reputation over the past twenty years. Artists will now have the convenience of purchasing art materials in the Foothills with easy access and plenty of free parking. Sarnoff Artist Materials will be adding what we have been known for over the past twenty years. 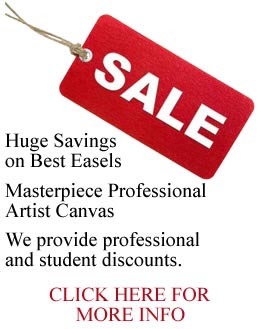 Quality art materials, great prices and service. If there is something you need from our main store on Campbell Avenue we can have it delivered to Paloma Art the next morning. Stop by and say hello to our staff, Cindy Juliano and Erica Sarnoff. We will still be at our original store on Campbell Avenue where you will see our regulars who have been with us for many years, Jinou, Tad, Leonard, Ernesto, Ester and Henry Sarnoff. Fine & graphic artist supplies --- Purchase at our store or via phone or online. Getting your quality products and materials has never been easier. 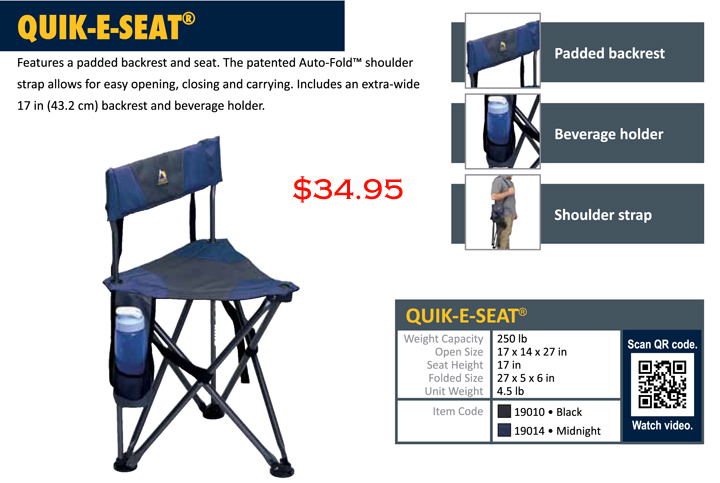 Furniture --- The basics to the best --- easels, chairs, cabinets, files, drafting tables, etc. 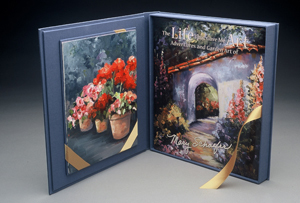 Albums & Journals ---Sarnoff offers all types for storage, viewing or presentation. and note card sets to suit any occasion. Paper --- We offer some of the finest paper in the world. Handmade, machine-milled, printed and unprinted natural fibers, special textures, inclusions, deckled edges, corrugated, or glossy. Specialty pens --- MontBlanc, Sailor, Pelikan, Faber Castell, Montegrappa and more. Custom framing --- We carry over 1,000 different frames to choose from. Display your work or a prized painting in style. Digital printing --- Check out our 64" wide Epson 11880 for Giclée prints. Staffed by artists, for artists. Our staff is ready to help you and thank you for your years of patronage. Sensu was developed out of a desire to have an authentic brush to use with drawing and painting apps on iPhone, iPad, and other capacitive screens. Like your iPad, the Sensu brush is truly portable. The protective cap becomes the handle for the brush when in use. When you’re done painting, simply insert the brush tip into the handle chamber and push closed. The brush is now safe for travel and a rubber stylus nib is exposed that can be used for other navigation. Read my book, ‘THE LIFE THAT GAVE ME ART’, which shares with you a collection of 131 paintings and 61 photos, all have documented my many experiences adding up to a mother lode of memories, emotions and passions put to paint and prose. My life is my credential. Barbara Rogers: The Imperative of Beauty, the first book to document Tucson artist and educator Barbara Rogers’ life and work in detail, is designed and produced by Marquand Books, an award winning publishing house specializing in the design and production of fine art books; and distributed by Hudson Hills Press, the premier source for books on 20th century art. This 224-page book includes 150 color plates and 25 black & white images. Thirty-percent of the profit from the sale of the book will be donated to the Barbara Rogers Graduate Fellowship in Painting at the University of Arizona School of Art to provide support and encouragement to the artists of the future. The Imperative of Beauty traces Rogers’s earliest influences and education, the shift in her practice following Hurricane Iwa, and her work since that time, which has grown increasingly complex and ambitious. 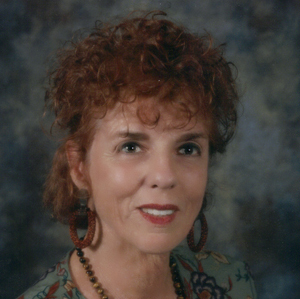 Three essays examine the evolution of her work. Art historian, Paul Eli Ivey explores the work up until 1985; New York writer and critic, Carter Ratcliff, sees her work moving from turmoil to serenity; and museum director and curator, Marilyn A. Zeitlin considers her approaches to beauty and the tradition of ornament. 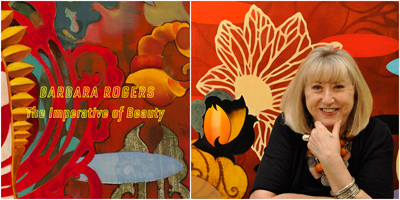 Interviews in the artist’s own voice reveal the relationship between Rogers’s life experience and her art. The book not only documents the progress of an individual artist but also reflects the trajectory of women working in the arts in the latter part of the twentieth and the early part of the twenty-first centuries, and the challenge facing an artist working in the American West outside the world’s major art centers. 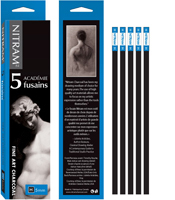 For the discerning artist that requires a rich black for drawing, then Nitram B is the answer. It is very soft, yet is still able to carry a point for working rich blacks into the paper or canvas. 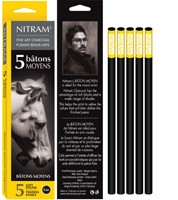 This medium soft charcoal is the one most preferred for drawing and sketching. Nitram HB’s superior hold is perfect for homogenizing tones and retaining tonal detail. 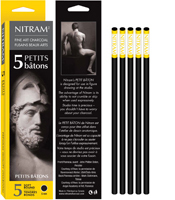 Nitram H can be sharpened to an extra fine point for creating fine detail in your drawing. Also, the unique hardness of Nitram H makes lighter and mid tones easier to attain. Each package contains five (5) batons. The advantage of Nitram is its ability to not crumble or skip when used expressively. Studio time is precious – you shouldn't have to worry about your charcoal. 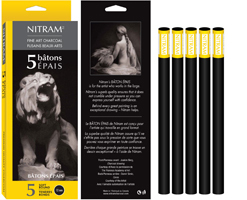 Nitram Charcoal has the advantage of rich blacks and a wider range of shades. This helps the artist to refine the values that will later define the finished piece. 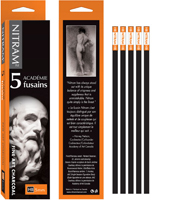 Nitram's superb quality ensures that it does not crumble under pressure so you can express yourself with confidence. 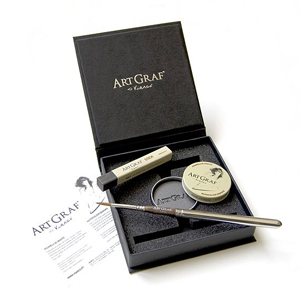 The ArtGraf Water-Soluble Graphite Set includes: one Watercolor Graphite tin (20g), one Graphite stick and one Escoda Series 1215-4 Prado Tame synthetic pocket travel brush. With a wet brush the graphite can be used to achieve a wide range of tonal values. However, it can be used wet or dry. The graphite is erasable once dry. Sarnoff Art supplies the artist materials for this fine useful and educational product. All supplies fit in a pocket or purse…grab it and go! Art is as basic to the human experience as talking, laughing, or any other form of communication. It allows us to reach beyond any geographic limitation and even touch those in some distant future!! Artwork that pre-dates any known civilization is still preserved on rock walls even after many thousands of centuries of history have passed. Art is our basic expression of who we are as individuals and as a culture. Artists throughout time have always found ways to express a particular point of view through the creative use of materials found in nature such as botanical or mineral pigments, hand-made cotton papers, and natural hair brushes. Art has evolved with science and technology right up to virtual art and digital printing. Sarnoff’s offers everything you need to share your vision from the World’s finest manufacturers, some of which have been producing materials for Artists since the 12th century! Visionary artists have always sought better ways of making their dreams a reality. Sarnoff’s is proud to offer museum quality fine art materials. Hand crafted Fabriano Papers have been a favorite to this day. Watermarks can be found in artwork and letters of some great artists of the period, such as Michelangelo Buonarroti. Sarnoff’s offers a full complement of the world’s finest art supplies including legendary Fabriano, Arches Papers, Winsor & Newton, and many others. Any serious discussion about artist’s brushes must include Kolinsky Sable. Kolinsky Sable brushes offer unmatched performance for water colorists so several manufacturers offer them as part of their flagship line. Windsor Newton Series 7 Brushes were created at the behest of Queen Victoria. Gustav Sennelier established his art supply company in 1887. His Oil Paints, Pastels, and Pigments have been a favorite of iconic Master Artists ever since then. The Sennelier client list reads like a who’s who of top Artists seen in museums and serious collections all over the World. Sennelier remains one of the only companies that provide natural pigments that Artists can use to create their own paints. Many other brands of supplies and artist’s materials have been used throughout the history, we proudly offer them all. 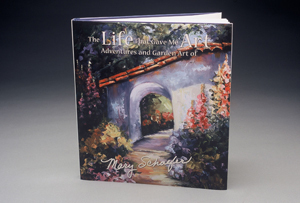 Sarnoff Artist Materials is the leader in providing classic fine art supplies in the Southwest. We offer the World’s best materials for professional and expressive Artists. Whatever you can dream, we can help you create. Thank you for visiting our website and we hope to see you in our store.